Devranjan is a tailor employed at a small shop on Brigade Road who gets paid Rs. 200 on a daily basis. He lives on Hosur Road and travels to Brigade Road every day for work, shelling out between Rs. 35-40 every day. As there are no direct buses to his place, he needs to switch between buses every day. This clearly shows that Devranjan spends at least 17 per cent of his monthly income on commuting to and from his workplace. He is one among the many who face the wrath of expensive public transport in Bangalore. Connectivity between buses and the cost of bus passes have always hurt the pockets of the lower income group. Shanti Mary, who works as a cleaner on a contract basis on Brigade Road has been recently appointed to work in this locality. She earns Rs. 6000 a month and lives in Kalasipaliya. Although, Shanti Mary works close to a metro station, she cannot afford it. "Namma Metro is for the wealthy, I will continue to change two buses and travel to work", she remarked. Similarly, Lakshmi who lives in Peenya, works at a house in Malleswaram. She leaves home as early as 6 am to reach her workplace by 9 am. Citizens of Bangalore spend endless hours in commuting to work. And the cost of commuting has always hit the lower middle class who depend on buses. S. R. Kalyankumar, Controller, Western Division, Bangalore Metropolitan Transport Corporation (BMTC), agreed that the price of travelling is definitely a worrisome issue in Bangalore. He said, "The cost of operation is very high in Bangalore. We are the bulk indenters of petrol and hence we have to pay high taxes for maintaining petrol bunks". Kalyankumar also claimed that Bangalore was one of the very few metros that are running a profitable public transport institution. Bangalore also had the tradition of disposing buses as scrap every four years. All this has accounted for the expensive transportation in the city. H. Murali who heads the Namma Cycle group?? in Bangalore and his team encouraged people to use the cycle as their mode of transport to work. This had two incentives; it improved health and controlled the pollution levels in the city. Murali told the Observer that he saw a lot of hope in the lower income groups of the city but failed to see an equal response from the corporate crowd. Murali believes that his endeavors would reap the necessary results. On the contrary, Kalyankumar felt that the Bangalore road infrastructure of Bangalore does not promote the movement of cyclists. He feels that travelling by cycle is too early to be a vision. Dr. M. A. Saleem, additional commissioner of police (traffic) felt that the new daily pass schemes from the metro rail and greater connectivity to Majestic and other important points in the city could help citizens manage the cost of commuting. Kalyankumar was not able to give any specific solution. He felt that people should reside closer to their workplaces. The lower income groups should enroll for bus passes. People should be more aware of the topography of the city and learn to use the bus system more efficiently. There are buses available to the main points of the city for the benefit of citizens. As a result of this, one wonders if the gentleman who makes a living out of selling maps on Brigade Road and lives in Lingarajapuram should start looking out for an accommodation near his work place. Can we really blame the government when they pass laws to convert residential areas into commercial hubs? Two new loop services will provide local transport for Whitefield. Residents can avoid using cars to travel from one area to another. BMTC has increased number of bus routes and frequency. Good Report Though the transport is costly which is very difficult for lower income people one more point the amount of time and effort a person dedicates in the daily travel is a issue. I hope when I come to Bangalore will get some cheaper transport. It is better 4 people together hiring a taxi in Bangalore. There are some cab providers who charge affordable fares. It is really a affordable for 4 peoples group. Last week i hired Olacabs taxi from MG road to Kormangala. It is really a affordable for 4 peoples. I understand urban transport in other metros are comparatively cheaper. The other RTC’s are not disposing four year old buses, but they are utilising long haul buses after some time for city/urban transport.As high speed driving not possible in Metros, old reconditioned buses can do the job. Autos are mostly using cheaper gas fuel, but hire charges are being worked out /I am told/ on the basis of petrol rates. 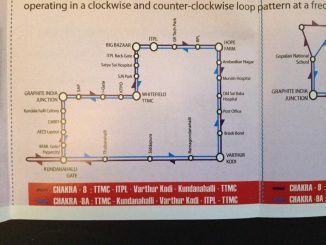 Rationalisation of BMTC bus routes, connecting un connected areas, will be of help. Using mini buses at higher frequency in small /congested localities, may also help. For example Gandhibazar/Basavangudi, is not connected to HOSUR ROAD,RING ROAD ,white field, where much activity is going on and workers have to go there. Good report. The problem of costly public transport is a major issue for the lower income group people working in the unorganized sector. But one needs to appreciate the fact that a profitable public transport institution is being run in Bangalore unlike most other cities in India.